Once you have successfully scanned your blank form, you are ready to create a new template in Focus Next Steps. From the left-hand side of your screen, select the Templates button. The Templates screen displays with a list of templates currently in your inventory. Select the +New Template button. The New Template screen displays. Follow the steps outlined to complete the requirements for the New Template screen. 1. Create a name for your new template and enter it into the Template Name field. Note: In this example, the title aligns with the contact card example provided above. 2. Select the dropdown arrow in the New Adult Membership Type field* and select the correct category for the new adult membership. Note: If your form has an adult’s information and that adult is not defined in your ChMS, this is the status they will be assigned in your ChMS when added. 3. Select the dropdown arrow in the New Child Membership Type field* and select the correct category for the new child membership. Note: If your form has a child’s information, and that child is not defined in your ChMS, this is the status they will be assigned in your ChMS when added. 4. Click the Select file button next to the Template field. This step allows you search within your Dropbox for the PDF you created of your blank form. Note: In the example above, the file previously scanned has been uploaded. If you need to change the file you uploaded, click the Change file button to the right of the Template File field. 5. Select the Next Step button to navigate to the next screen. A new screen displays with an image of the form(s) you scanned. 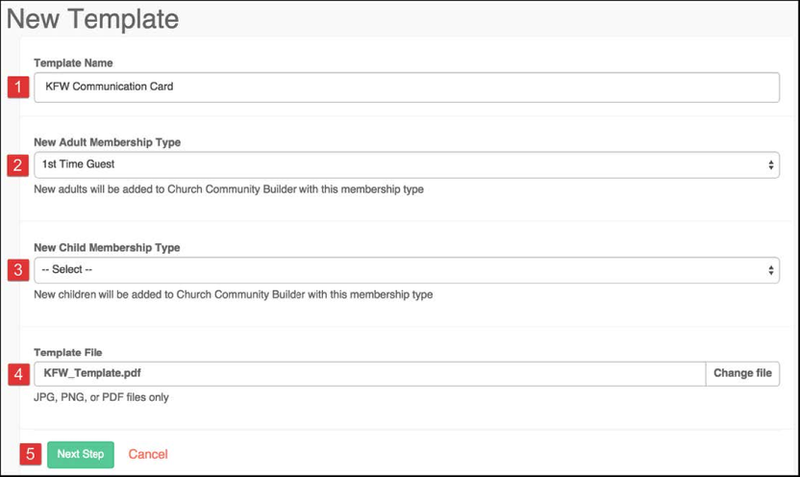 *It is important to note that from both the New Adult and New Child Membership Type fields, the options included within each of the dropdown boxes come from your church management software. If you need additional statuses, please define them in your ChMS, then setup your template. A double-sided contact card was utilized for the purpose of this training manual. In the example above, the images appear on two pages. If you’re setting up a single-sided form, you will only see one page in your template setup session. Follow the steps to complete the process for creating a new template. 1. Beginning with the first page of your scanned form (page 1 of 2 in the above example), highlight the first answer block by clicking and dragging your mouse to select it on the card image. 2. Click on the dropdown arrow in the Person field and select the category that most closely aligns to the answer block. In this example, the Primary Person category should be selected. 3. Click on the dropdown arrow in the Field Type field and select the category that most closely aligns to the field. In this example, the Name category should be selected for this data field. Note: Some forms will have questions related to more than one person. For example, child registration forms include information about the legal guardian and child. When setting up the fields related to the legal guardian, choose primary person as the person. 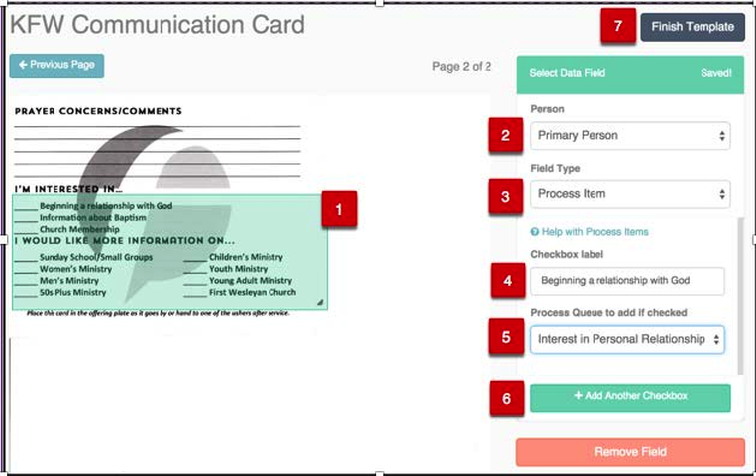 When setting up the fields related to the child, choose “child” for the person. 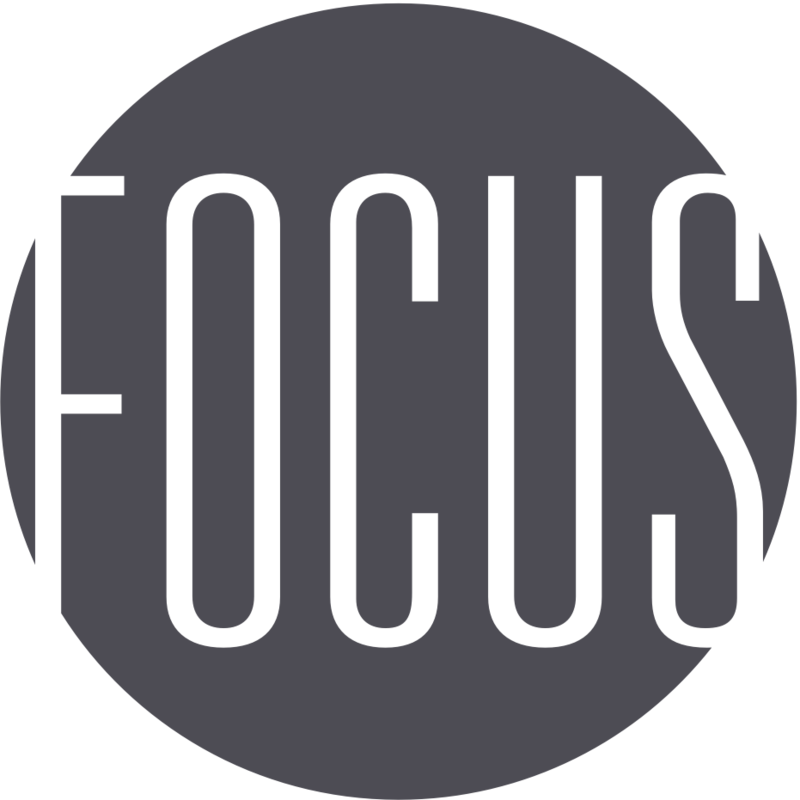 That way the Focus Next Steps system knows which information to attribute to which person in your ChMS. 4. Highlight the second answer block (in this example, the Email answer block) by clicking and dragging your mouse to select it on the card image. 5. Click on the dropdown arrow in the Person field and select the category that most closely aligns to the answer block. In this example, the Primary Person category should be selected. 6. Click on the dropdown arrow in the Field Type field and select the category that most closely aligns to the field. In this example, the Email address category should be selected for this data field. Note: When clicking and dragging your mouse over each of the answer blocks, it is acceptable to overlap the highlighted fields. Each time you set up a new field, select the person to whom the answer refers, as well as what information is contained in the field’s answer. You will repeat this process for all fields you wish to automatically process, and move into your ChMS. 7 This is an example of a process item answer. Process items are checkboxes that trigger some process item within CCB. Highlight all of the checkboxes as a single itemto reduce the cost to process the field. 8 Select the dropdown arrow in the Person field. In this example, these checkbox items refer to the Primary Person, so we select that option. 9 Select the dropdown arrow in the Field Type section and select the category that most closely aligns to the field. In this example, Process Item should be selected. 11 Click on the dropdown arrow in the Process Queue to add if checked field, and select the option that most closely aligns to the field. In this example, the 1st Time Visitor – Letter section should be selected. 12 Click the Add Another Checkbox button for each checkbox field referenced in the highlighted section and repeat steps 10-12 for each field. 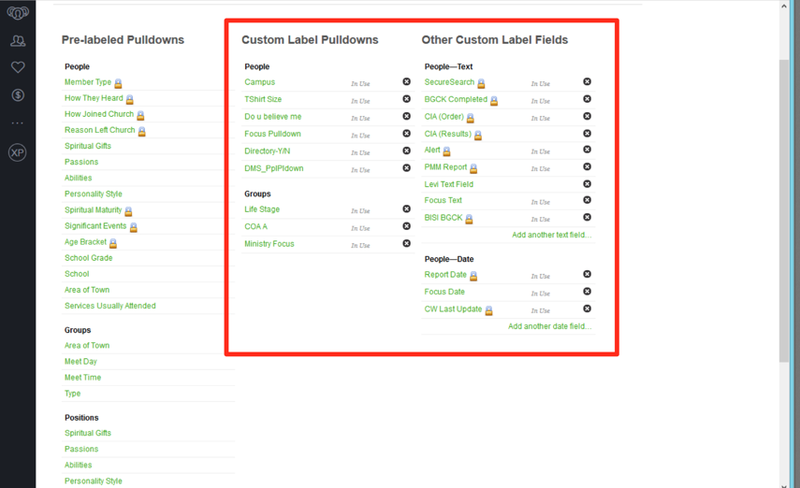 Note: While it is important to highlight the entire row of checkbox fields, you will need to individually update each Checkbox label field and Process Queue to add if checked field. To successfully complete this task, you must click the Add Another Checkbox button following each completed entry. Important: When determining which answer blocks to capture, do not highlight any answer blocks that are typically not stored in your ChMS (e.g., prayer requests). 1 Highlight the next answer block by clicking and dragging your mouse to select it on the card image. 2 Select the dropdown arrow in the Person field. In this example, the I’m Interested In… answer block refers to the Primary Person, so that category should be selected in the Person field. 3 Select the dropdown arrow in the Field Type section and select the category that most closely aligns to the field. In this example, Process Item should be selected. 5 Select the dropdown arrow in the Process Queue to add if checked field, and select the option that most closely aligns to the field. In this example, the Interest in Personal Relationship category should be selected. 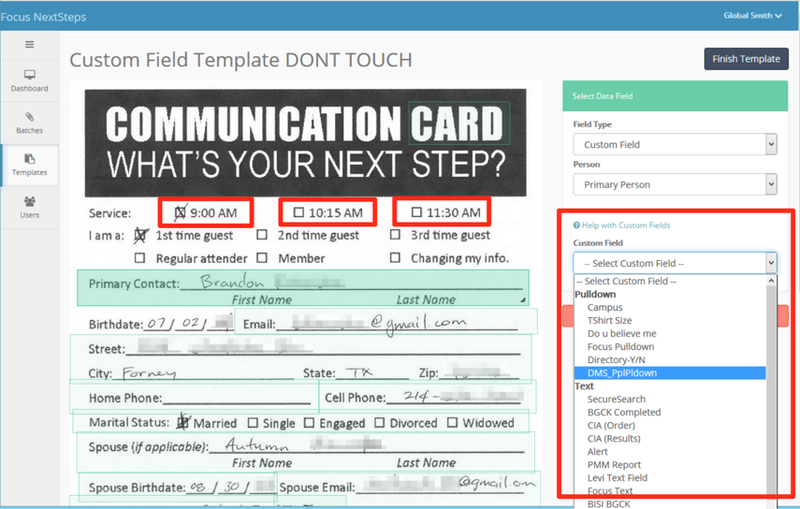 6 Select the Add Another Checkbox button for each checkbox field referenced in the highlighted section and repeat the steps above for each field. 7 Once you complete the process for capturing each of the answer blocks, and labeled each category, select the Finish Template button. For CCB users, we now are able to pull through your custom field data through the API. 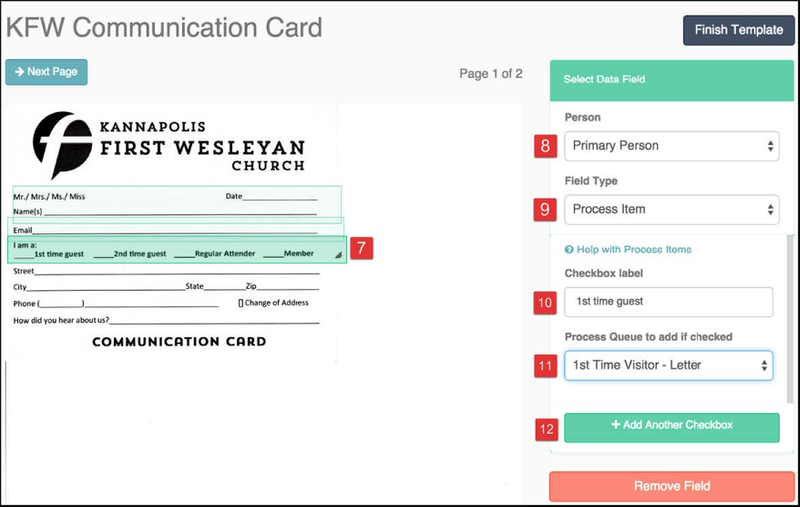 Available for your custom text, date, and pull-down fields (for both individuals and groups), you can now associate fields in your card templates with corresponding custom fields you’ve created in your CCB account. To take advantage of this new feature, first make sure you have your fields set up inside your CCB account. Due to the accurate nature of our OCR technology, it will be best to exactly match the label of the card’s field to the label you create in the custom field in CCB, so be sure to double check and make any adjustments necessary to avoid any possible issues down the road. Please note that you will be limited to 12 text custom fields, 6 date custom fields, and 6 pull-down custom fields. This is a limitation of CCB, not of the Next Steps platform. 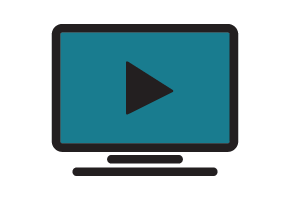 For Text custom fields, we will replace any existing value with the new value submitted into the CCB record. If the text field on the card is left blank, however, it will be ignored and no existing data will be removed from your records.